Operational reliability at the Kollsnes natural gas processing plant in Norway was recently improved with the installation of an Europafilter Kidneyloop oil filtration unit. Basil V R Greatrex is the exclusive distributor of Europafilter Kidneyloop oil filtration units and oil filtration systems in Australia. 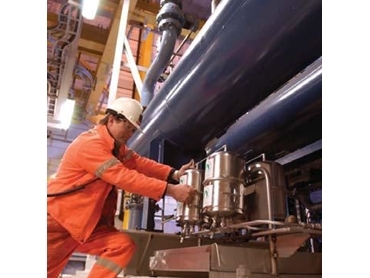 Site operator Statoil Hydro ASA had encountered problems with the performance of five gas compressors at the plant, and after investigation identified the cleanliness level of lube oil used in the system as the source of the trouble. To ensure continued operation, ten screw pumps at the site needed to be dismantled for maintenance and service every three months, costing the company time and money. To remedy this situation, a Europafilter Kidneyloop oil filtration unit was installed in an offline circuit at the plant. This system now continuously treats oil compressor lubricant while the units are in operation, cleaning and returning oil to reservoirs on each. Statoil Hydro ASA have reported a significant reduction in wear on the compressors since the oil filtration unit was installed, as well as lower rates of oil consumption. As testament to the effectiveness of the system, the company has found no need to change the oil in the compressors since the unit was installed.